A traditional crop of the Mediterranean, I’m quite surprised that in my purchases of Olive oil, I have never thought to buy a bottle of Greek olive oil, tending to pick Italian, Spanish or even Australian before even considering Greek. In part, this is hardly surprising: Italy and Spain actually produce over 60% of the world’s olive oil. But if the statistics are to be believed (and this from someone who wasn’t particularly great at A level Maths with stats), Greece actually has the largest per capita olive oil consumption in the world: which would tend to suggest one thing. They’re keeping the good stuff for themselves. Of course, with the global financial meltdown, and the Greek economy needing a shot in the arm, the good stuff finally seems to be making its way out on to the global market – complete with style and flair. 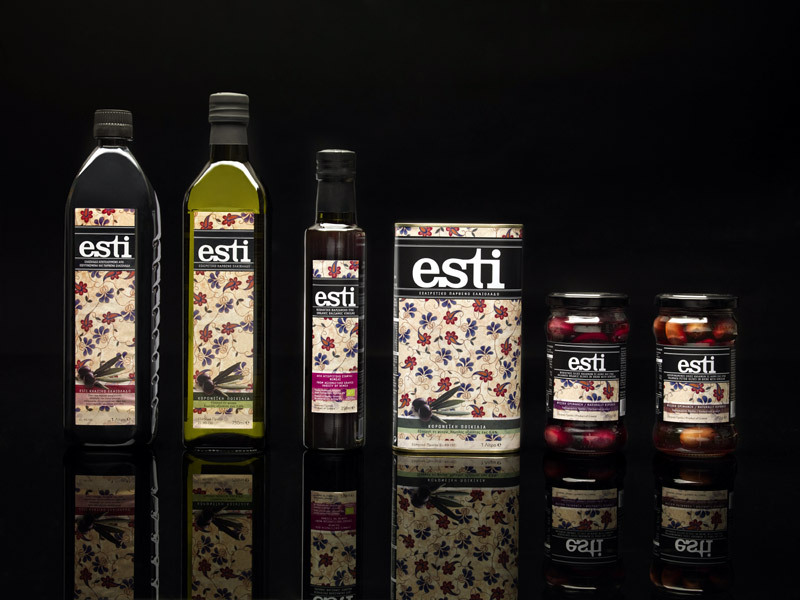 Originally established by two brothers in 1912, in Kalamata, Esti has grown to become one of the largest producers in Greece. They grow a unique variety of olive called Koroneiki, named after the historic town of Koroni, in the Messinia region of the Peloponnese. Koroneiki olive treese produce fruit that ripens between November and December and produces an excellent quality olive oil with exceptionally low acidity, a deep and bright green colour, with a fruity, bittersweet taste and smooth feeling of various fruits with a predominant apple taste. 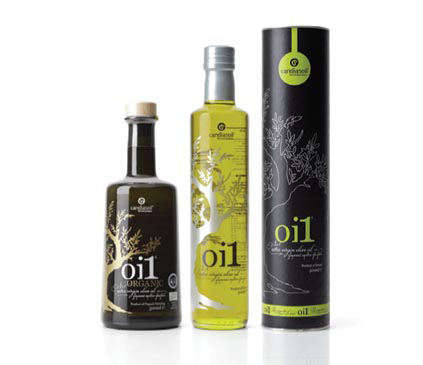 Today, not only does the company produce oil, they have also branched out into olives and vinegars. Based on the island of Crete, Candiasoil produces Extra Virgin, Organic and PDO olive oils. The Extra Virgin and Organic oils use the native Koroneiki olive, while the the 3 PDO oils are from 3 distinct areas, namely Peza, Sitia and Viannos. Each bottle is beautifully presented. In a clear, sleek, glass flask simply engraved with a modern Greek letter logo and hand-sealed by a special silicone cork, exists one of the most expensive olive oils available today. 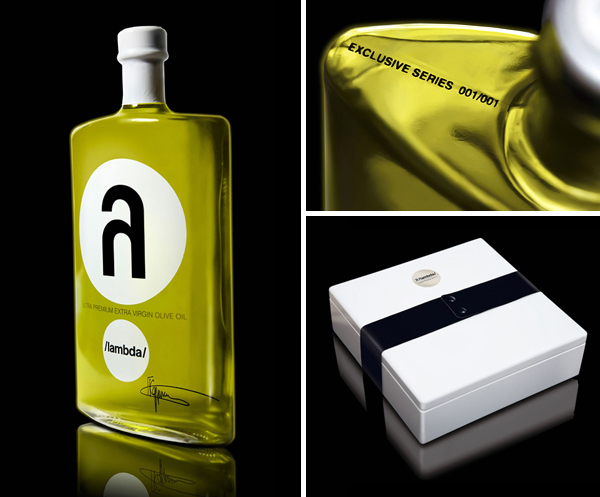 At 150 Euros for 1,000 ml, Lambda is branded as the first luxury, ultra-premium extra virgin olive oil in the world. Lambda’s olives are pressed within eight hours of picking and processed through careful cold extraction. Then workers fill and label each flask by hand, without any machinery, to limit the harmful oxidation process which can affect taste and quality. Just a note, if you read more deeply into industry statistics, which I would be happy to provide for you. Because of the quality of Greek olive oil (70% of which is virgin by nature compared to 35% in Italy and 15% in Spain), 70% of Greek olive oil IS EXPORTED IN BULK TO ITALY and SPAIN. Without importing Greek olive oil at low prices, Italy and Spain would be unable to meet the demand for their “Italian” and “Spanish” olive oils. This means that the extra virgin olive oil you are enjoying around in the world, that is branded as Italian or Spanish, is in its majority Greek. Just look at the numbers of exports imports of olive oil for the three countries.